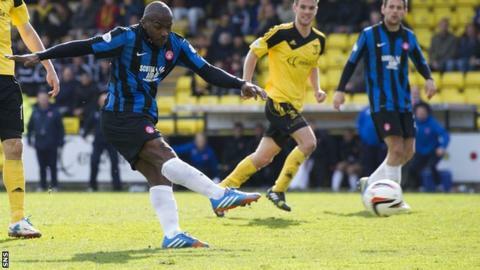 Jason Scotland's 86th-minute equaliser snatched a point for 10-man Hamilton Academical in a game where Livingston looked to be taking all three. Scotland smashed home Louis Longridge's through ball to ensure Livi still have not beaten Accies since 2012. Kyle Jacobs had stabbed Livi ahead on 64 minutes after Accies' left-back Stephen Hendrie had been booked twice. The hosts also squandered a first-half penalty when Marc McNulty thumped off the top of the post. So Hamilton eek out a point in unlikely circumstances and drop two behind leaders Dundee, who thumped Cowdenbeath. Livi have now gone three games without a win and their outside chances of a play-off spot might have been smothered by Scotland's leveller. From the off, the hosts looked like the team going for the title, Mark Burchill and McNulty both forcing Kevin Cuthbert into good saves. The illuminous boot of McNulty then struck a venomous 25-yard free-kick, which Cuthbert palmed over with one hand. Longridge had Accies's only clear-cut opportunity apart from their goal, his low angled effort making Darren Jamieson work just before the break. Referee Stephen Finnie gave Hendrie his marching orders on 54 minutes after the 19-year-old left-back held back McNulty on the right. And 10 minutes later Livi made the advantage count, Jacobs netting his first since rejoining the West Lothian side from Kilmarnock. Scotland's equaliser was against the run of play and could have been made irrelevant had McNulty not scuffed a great opportunity to get his 18th of the season in the dying seconds. Match ends, Livingston 1, Hamilton Academical 1. Second Half ends, Livingston 1, Hamilton Academical 1. Attempt missed. Nejc Praprotnik (Livingston) right footed shot from the centre of the box is close, but misses to the right. Attempt saved. Marc McNulty (Livingston) right footed shot from the right side of the six yard box is saved in the bottom right corner. Hand ball by Ziggy Gordon (Hamilton Academical). Substitution, Livingston. Nejc Praprotnik replaces Martin Scott. Goal! Livingston 1, Hamilton Academical 1. Jason Scotland (Hamilton Academical) right footed shot from more than 40 yards on the right wing to the high centre of the goal. Assisted by Darian MacKinnon. Corner, Hamilton Academical. Conceded by Nejc Mevlja. Attempt saved. Keaghan Jacobs (Livingston) right footed shot from outside the box is saved in the top centre of the goal. Attempt missed. Jason Scotland (Hamilton Academical) left footed shot from outside the box is just a bit too high. Substitution, Livingston. Daniel Mullen replaces Mark Burchill. Substitution, Livingston. Keaghan Jacobs replaces Kyle Wilkie. Attempt missed. Andy Ryan (Hamilton Academical) left footed shot from outside the box misses to the right. Substitution, Hamilton Academical. Andy Ryan replaces Mickael Antoine-Curier. Goal! Livingston 1, Hamilton Academical 0. Kyle Jacobs (Livingston) left footed shot from the centre of the box to the centre of the goal. Corner, Livingston. Conceded by Martin Canning. Mike Mampuya (Livingston) wins a free kick in the defensive half. Nejc Mevlja (Livingston) wins a free kick in the defensive half. Second yellow card to Stephen Hendrie (Hamilton Academical). Marc McNulty (Livingston) wins a free kick in the attacking half. Attempt missed. Martin Scott (Livingston) left footed shot from the right side of the box is close, but misses to the right.